The U.S. burden of Alzheimer’s disease and related dementias will double by 2060, according to a new study published online in Alzheimer’s & Dementia: The Journal of the Alzheimer’s Association. This study is the first to forecast Alzheimer’s disease by race and ethnicity. Researchers predict that Hispanic Americans will have the largest projected increase due to population growth over the projection period, although because of the relative size of the population, non-Hispanic whites will still have the largest total number of Alzheimer’s cases. The burden of Alzheimer’s disease and related dementias in 2014 was 5 million people, which is 1.6 percent of the U.S. population in 2014 – 319 million people. This burden is projected to grow to 13.9 million, nearly 3.3 percent of the population in 2060 – 417 million people. This work was co-authored by researchers at the CDC, University of Wisconsin Milwaukee, and the National Center for Primary Care at Morehouse School of Medicine, including Anne Gaglioti, MD, FAAFP, associate professor of family medicine, director, Southeast Regional Clinicians Network, and associate director of research, National Center for Primary Care, Morehouse School of Medicine, and co-investigator, Integrating Special Populations, Georgia CTSA. “Early diagnosis of Alzheimer’s disease and related dementias (ADRD) can help patients and families prepare for the future and obtain needed support. We encourage elders or those concerned about their memory, especially those in African American and Latino communities who are at highest risk for ADRD, to speak to their health care provider about getting screened for memory problems,” says Gaglioti. 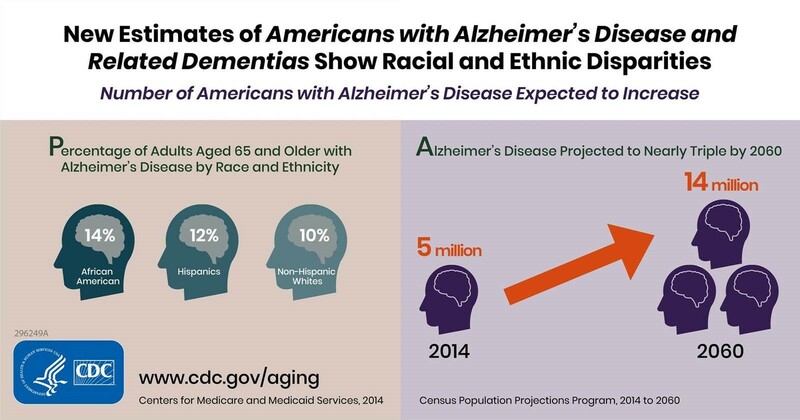 For more information on CDC’s activities related to Alzheimer’s disease and the Healthy Brain Initiative, visit https://www.cdc.gov/aging/index.html and www.cdc.gov/aging/healthybrain. For more information on the National Plans to Address Alzheimer’s Disease, visit https://aspe.hhs.gov/national-plans-address-alzheimers-disease. For more information on the Alzheimer’s Association’s resources for caregivers, professionals, and communities please visit https://www.alz.org/. Georgia Clinical & Translational Science Alliance’s (Georgia CTSA) Integrating Special Population program efficiently translates research testing and discovery to special populations and further advance health equity. The Georgia CTSA is a statewide partnership between Emory, Morehouse School of Medicine, Georgia Tech, and UGA and is one of over 50 in a national consortium striving to improve the way biomedical research is conducted across the country. The consortium, funded through the National Center for Advancing Translational Sciences (NCATS) and the National Institutes of Health’s Clinical and Translational Science Awards, shares a common vision to translate laboratory discoveries into treatments for patients, engage communities in clinical research efforts, and train the next generation of clinical investigators.